We've been getting emails asking when, when, when? The next Progressions will be on the 9th September 2006 (Saturday). 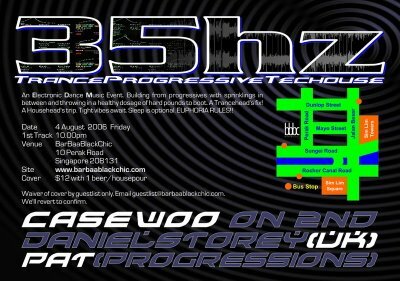 Then we'll be doing Progressions presents Industry on 11th September 2006 (Monday), a special monthly catered for the hard-working staff in the F&B / Clubbing industry... hey, even if you're not, you're still welcomed. When is the next classics night? You'll find out soon enough. Click on above flyer invite. Right click, save as and print out. ENTRY BY FLYER INVITE OR GUESTLIST ONLY! LIMITED CAPACITY. Entry by guestlist before 11pm. Email Progressions with your FULL name (as appears in your ID card) and the names of your friends coming with you before the end of 25 August 2006 (Thursday). No guarantees as guestlist availability is very limited. You are added once you get a confirmation reply. First come first serve. Barbarblackchic and Progressions’ Yukun team up once again to showcase two very talented local deckmeisters. 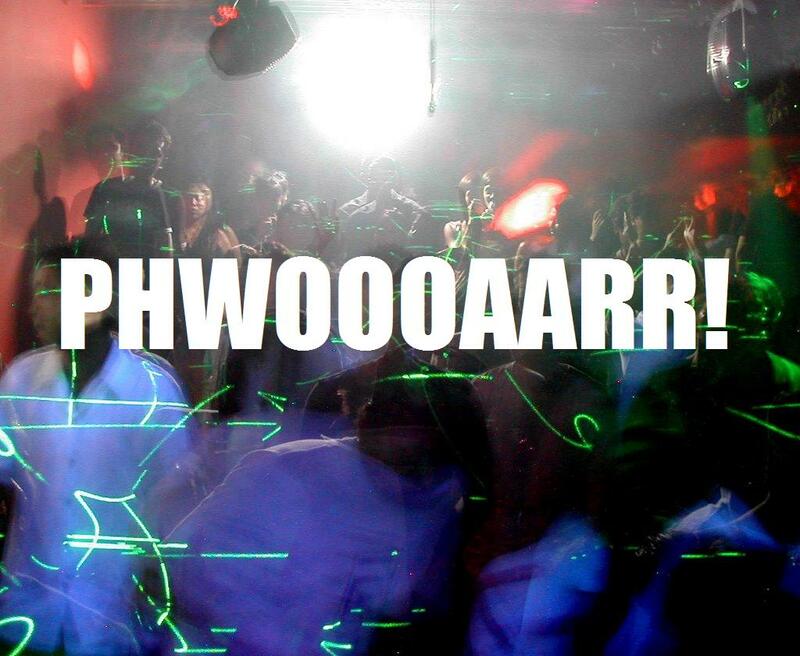 Gear up for yet another massive night of uplifting euphoria that will send hands-in-the-air and grins all around! With a DJ career what started back in 1999, Itchi has graced the decks of numerous parties with an arsenal ranging from Progressive House, Breaks and Trance. He recently represented Singapore at the Pioneer Pro DJ Digital Battle Regional Final and clinched the runner-up position. Having played at prestigious clubs ranging from Liquid Room to Zouk … expect a mural of sound when he makes his debut for the 35hz brand night. Formally WRKZ 91.3 and now at Power 98, Jensen is a familiar voice during the day over Singapore airwaves. From being a radio presenter, he has gone into the realm of club DJing with his love for euphoric trance… and has since headlined his own night “In Transit” at DXO as well as guest slots at Liquid Room and Sentosa’s New Year’s Eve 2006 party, playing to a massive 15000 attendance. Entry : By invites only. Each flyer invite admits 2 before 11pm. After 11pm, $12 inclusive of ONE housepour or beer. Photos courtesy of Deny The Boy! Entry by guestlist before 12 midnight. Email Progressions with your FULL name (as appears in your ID card) and the names of your friends coming with you before 6pm of 11 August 2006 (Friday). No guarantees as guestlist availability is very limited. You are added once you get a confirmation reply. First come first serve. 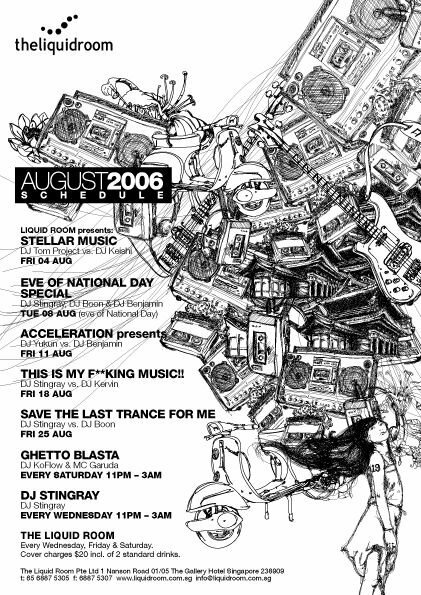 Liquid Room is ending it's historical reign at Robertson Quay by the end of August 2006 in the best possible fashion. This Friday, one of the fastest rising new talent Benjamin (aka CDJ Ben) together with two iconic veterans Yukun and the club's resident Stingray, will be creating more euphoric mayhem. Thank you to each and everyone of you for making the 1st anniversary of Trance Parade at Barbaablackchic such an unforgettable event, ramming it to the brim and making it one of the best attended gigs thus far this year! It was off the hook... big time! It was certainly interesting for P@t and myself to recreate what we did exactly one year ago, dishing out the classics, huge anthems, and even tunes that we'd probably not play in a normal circumstance. Most importantly, it's was cheers and smiles all around... a unique vibe was certainly in the air. It was the longest MOMENT X in the history of clubbing! Last year, we celebrated the nation's independence in the only way we know how... throwing a mad party till the wee hours of the morning! This year, we are doing it all over again. Those that attended that memorable event last year, will remember the mayhem that our headlining DJs Yukun and P@t brewed together. Smiles and grins were the order of the day. Expect a night of huge anthems, memorable tunes as well as a bag of classics trance that started it all back in the mid-90s. See you on the dancefloor. VALID WITH PRINTED FLYER ONLY. 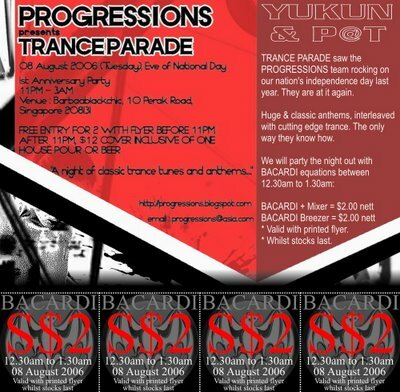 From 12.30am - 01.30am, party with BACARDI! Barcadi Breezer (by bottle) or Barcadi + Mixer (by glass) going at $2 nett each. Whilst stocks last. 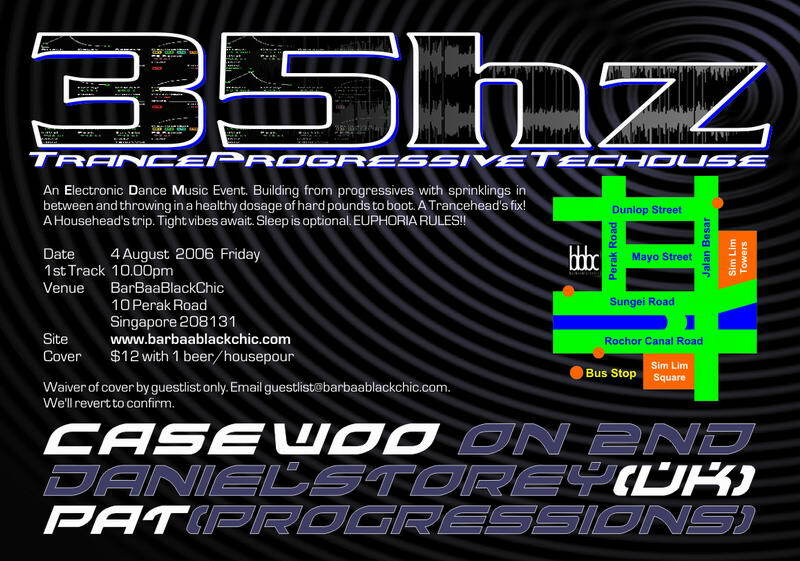 LIMITED copies of The Sound Of Progressions #1 and #2 promotional CDRs will be given out randomly throughout the night. Entry by guestlist before 11pm. Email Progressions with your FULL name (as appears in your ID card) and the names of your friends coming with you before the end of 03 July 2006 (Thursday). No guarantees as guestlist availability is very limited. You are added once you get a confirmation reply. First come first serve. Daniel Storey, with a 5-year residency at The Tube (Halifax, UK) tucked underneath his belt, has played alongside the likes of Hacienda stalwart Graeme Park, Norman Jay, Azuli Records' boss Dave Piccioni, Jo Mills and at Paul Taylor's infamous Retro house parties. 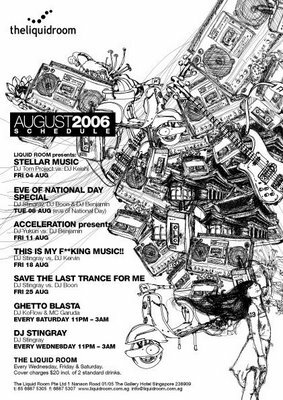 Summers were spent in Europe's clubbing capital, the island of Ibiza, playing marathon 8-hour sets at Kilties Bar in the heart of San Antonio. This led to regular guest appearances at the legendary Cafe Mambo with resident Pete Gooding of Renaissance. P@t, a veteran in the domestic clubbing industry, is one of the people behind Singapore's most consistent brand night Progressions. Today with Yukun, they have been sharing deck duties since their formative years. With countless headlining guest slots across Malaysia, Thailand and Singapore under his belt, he has been a regular feature at Barbaablackchic and Liquid Room, belting out his prominent brand of trance and hard-edge bangers!